A warm cup of gløgg and tasty ginger snaps welcome you as you arrive. And there’s a nicely decorated Christmas tree to put you in the mood as well. There’s Christmas music in the background, and on the weekend, you may be lucky to hear some live music as well. My main purpose for going is always the food. I look forward to buying freshly baked goods to bring home, having rømmegrøt for lunch, and stopping by the church’s store to stock up on some traditional fare. 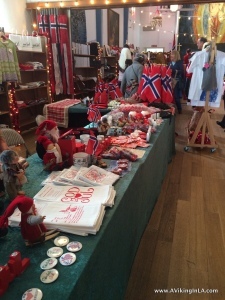 All the Scandinavian items for sale in the booths, some homemade and others professionally manufactured, are an added bonus and test my willpower to refrain from unnecessary purchases. I also greatly enjoy seeing friends from the days when I came with my boys to the Mommy & Me group. And of course, the opportunity to use my Norwegian is always a plus. The bakery didn’t disappoint. 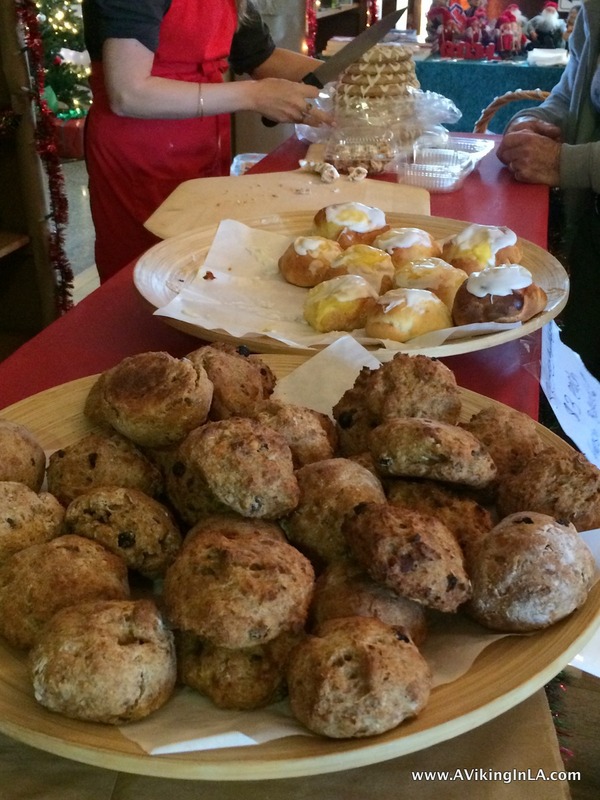 There was a never ending supply of freshly baked goods coming from the church’s kitchen—wheat buns and bread and skoleboller. In past years, there have been cinnamon buns, but I gladly welcomed the skoleboller. I actually prefer them. 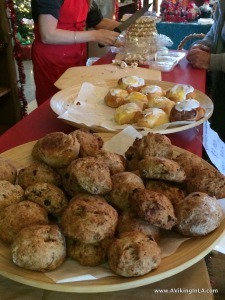 There were also kransekaker for sale and an assortment of other baked goods. I made sure to buy my skoleboller early so as not to miss out. As expected, rømmegrøt (sour cream porridge) was one of the many items on the “café’s” menu. I could have chosen from a variety of open-faced sandwiches, such as shrimp with egg salad or smoked salmon with scrambled eggs, made in the church’s kitchen, but decided to stick with my first choice. Included with the rømmegrøt was rød saft (red juice). And to finish off my meal, I added a waffle. It all hit the spot. 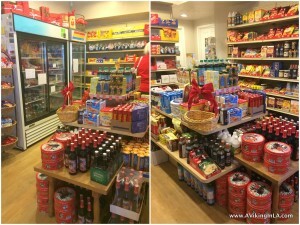 I ended my visit to the bazaar in the church’s store. It was important to get risengrynsgrøt (rice porridge) for Christmas, and I had to make sure I had enough for all my family who’s visiting this year. I also added some gløgg mix and blackcurrant juice concentrate for the kids. And how can I not buy some bottles of Solo (orange soda) and bars of Freia Melkesjokolade (milk chocolate)? 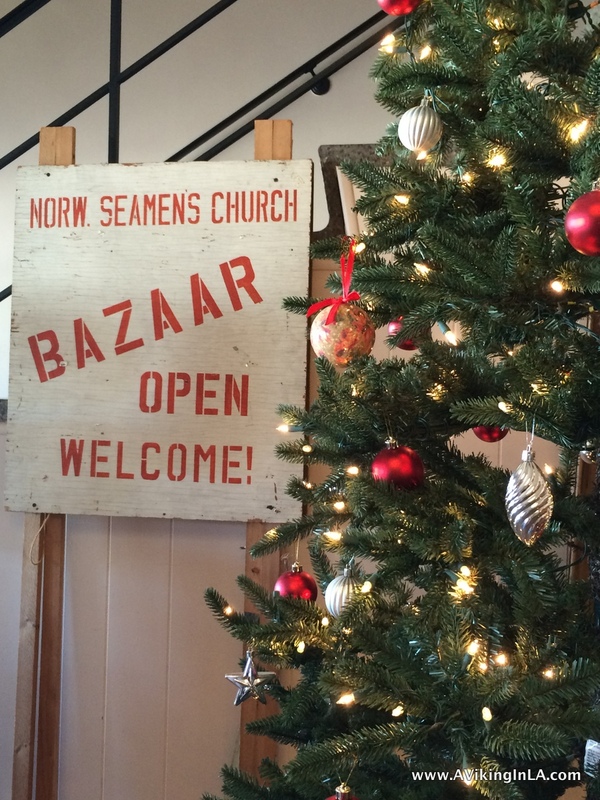 Going to this Christmas bazaar gets me thinking and excited about the next Scandinavian events coming up. Around the corner is SWEA Los Angeles’ Christmas Fair. 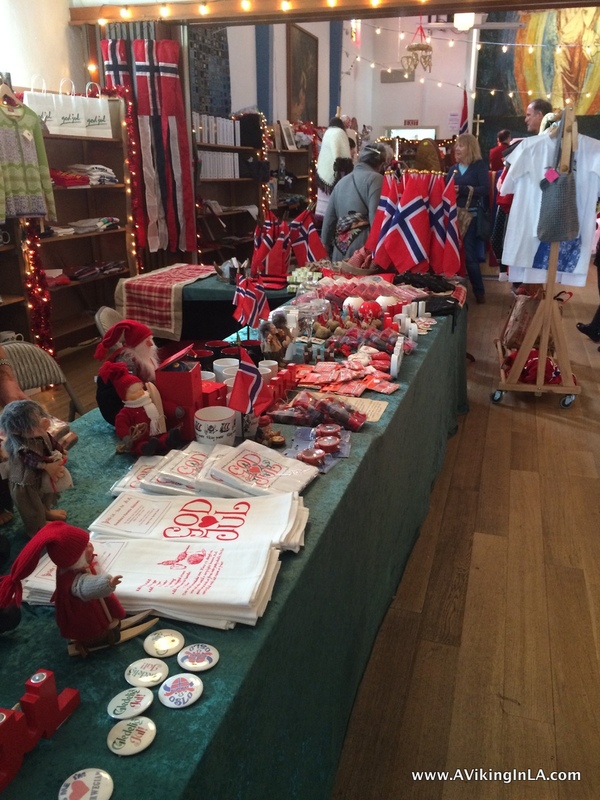 It is a one-day event focusing on Swedish crafts, culture, and cuisine on Sunday, December 7, at a new location this year, Los Angeles Theater in downtown LA. I’ve been to past fairs of theirs at the Shrine and always make sure to be there for the St. Lucia pageant which is a special treat. I will try to go again this year even though it’s looking like a busy weekend with sports and guests and even a CicLAvia event that I would have liked to do. While on the topic of Christmas celebrations, I’d be remiss not to mention the events happening at the Norwegian Seamen’s Church this holiday season. I personally haven’t been to any of them, but knowing the people who work and volunteer at the church, I’m sure they’ll be worth your time if you’re eager for some Norwegian Christmas spirit. It starts with a Christmas luncheon on December 2. Maybe this is the year I attend for the first time? You can see a full schedule of events at the church here. Then in January, there’s the annual Scandinavian Film Festival in Beverly Hills. I’m always curious what films will be featured there. I generally stick to Norwegian films and enjoy getting a glimpse of what’s going on in the film world in Norway. My calendar for the next couple of months is beginning to fill up. How’s yours looking? 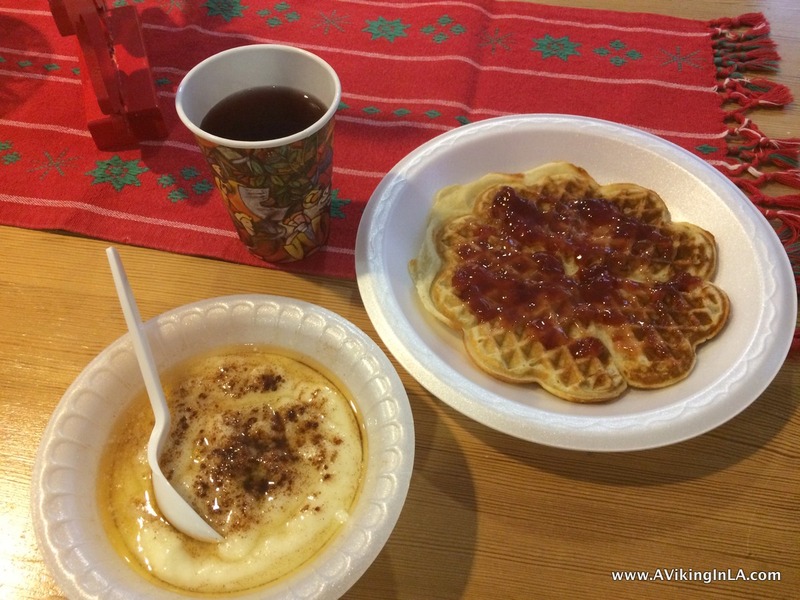 This entry was posted in Norwegian Culture and tagged Christmas, julebasar, San Pedro, Sjømannskirken by Patricia Zanuck. Bookmark the permalink. That looks like a fun way to kick off the holiday season! Yes, but I was thrown off the first year when the Christmas kick-off came before Thanksgiving! Now I’m getting used to it, especially since the stores begin their holiday displays and music so early. Love the pictures that you add to your post! Takk! Jeg prøver å gjøre det litt mer interessant med bilder. it’s better than any restaurant or specialty shop isn’t it?